George Elliott Clarke, an accomplished poet, playwright and essayist, turns his considerable talent to writing a novel offering a protagonist infrequently portrayed in Canadian literature. 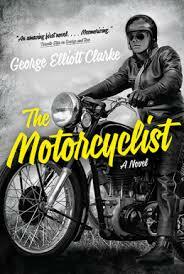 The Motorcyclist depicts a year in to the life of Carl Black, a young black man in post-war Halifax. Told with energetic and lyrical prose, the author, a Toronto-based writer born and raised in Windsor, Nova Scotia, was inspired by the motorcycle diary of his father. Clarke creates a character who is neither hero nor anti-hero, but rather one man attempting to negotiate his way within an environment that is limiting, laden with ‘British’ culture and potent with hostility. A ‘player’ in the dating world, Carl juggles dates with several females at a time as the novel progresses, aiming for conquest without entanglement. His pre-occupation with sexual gratification drives the plot, though not the novel’s ultimate message. Out of Newfoundland comes delicious contemporary satire from one of its “home-grown” authors, Edward Riche. A versatile writer of stage and screen too, in this fourth novel, “Today I learned It Was You,” Riche plots the imagined happenings of people in St. John’s with a wit and wisdom we come to expect from Newfoundlanders. The reader is transported beyond the charming veneer of ‘candied colored’ houses rising from the city’s shoreline, to witness the goings-on of ‘real’ people living messy, chaotic lives.